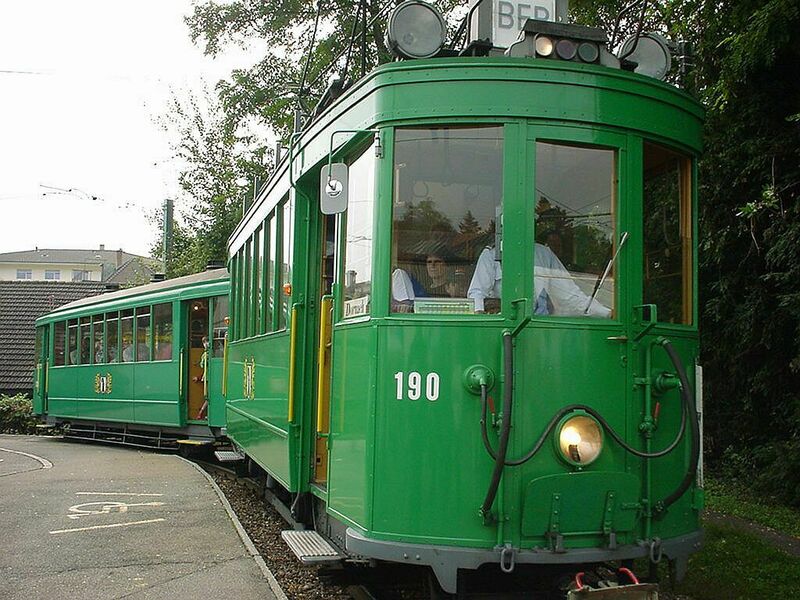 Tramclub Basel is a voluntary club organisation which maintains and operates historic Basel trams of the BVB (and its predecessor B.St.B.) but also of the Baselland side BLT. 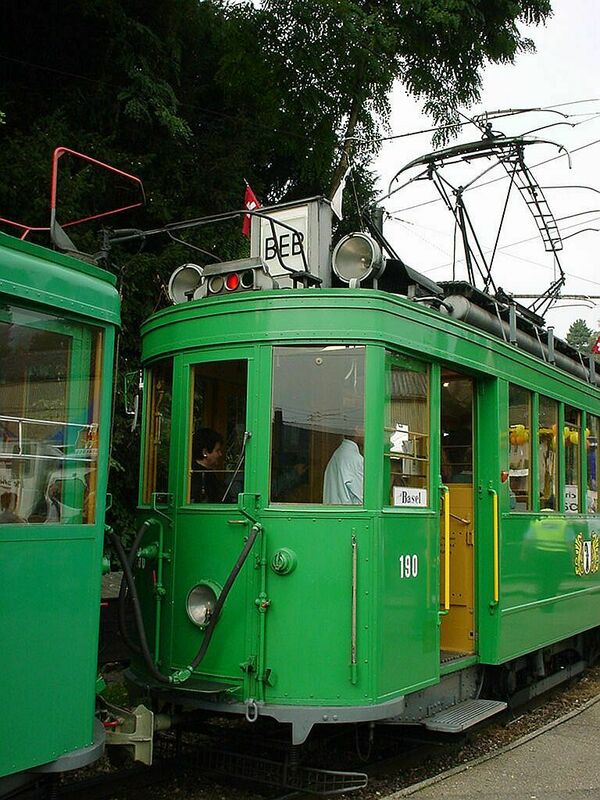 The tramclub does not own the old trams, it just maintains and operates them. In September 2002 the club�s homepage was here (page in German!). 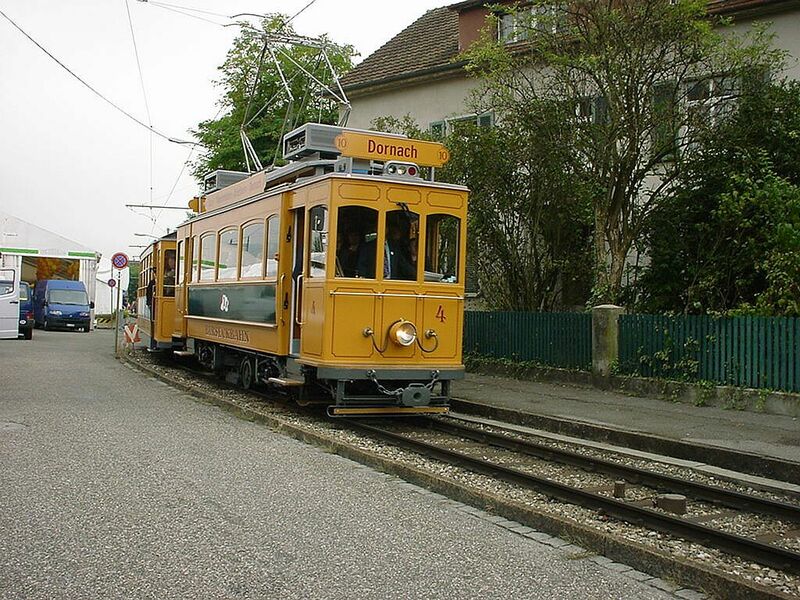 When the Birseckbahn, BEB, started its operation in 1902 it ordered four two-axle trams for their new Basel-Dornach service. 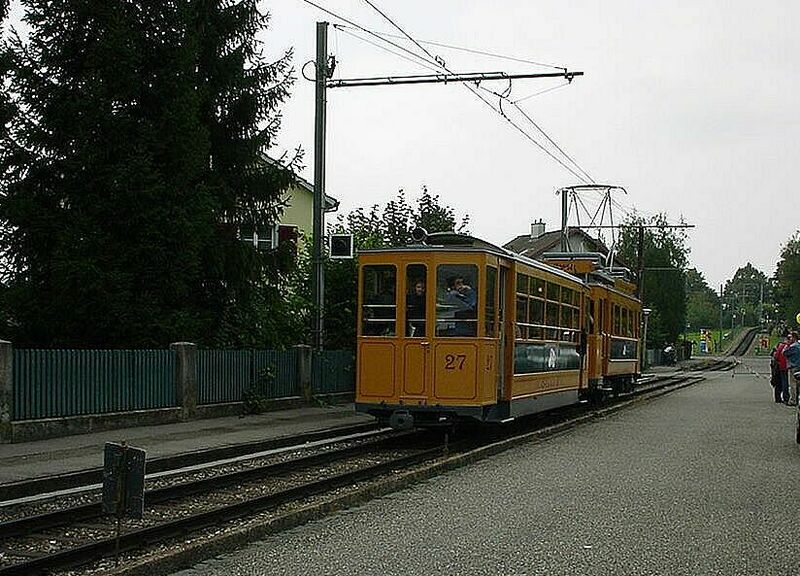 These Ce 2/2 trams no. 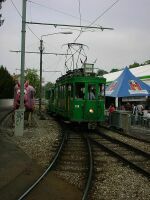 1-4 were given to the B.St.B., precursor of the present BVB to operate. 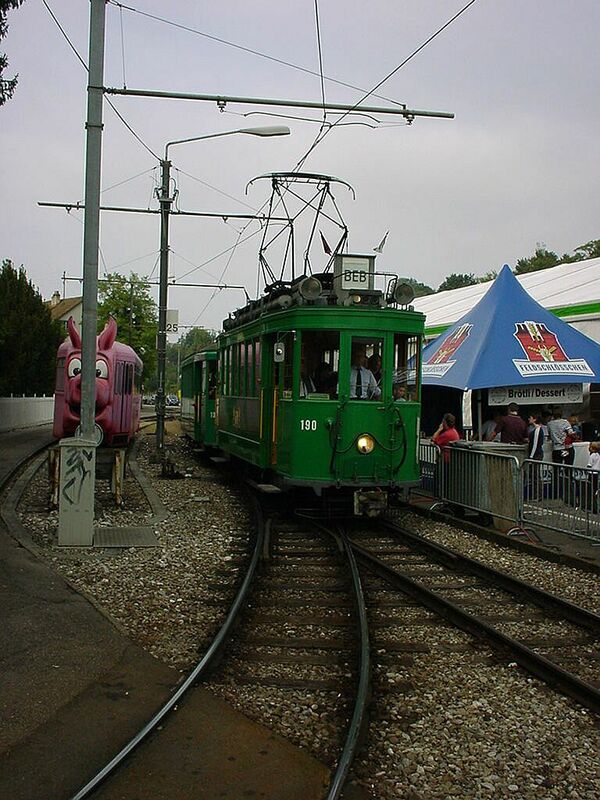 Out of the first four trams three have survived in some form to the present day. All four and also two further ones, no. 5-6 from 1905 were rebuilt to 3 axle trams in 1932. 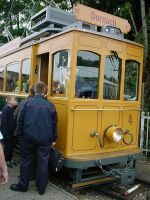 This one, number 4, was for many years listed as "zerbrochen" or "broken to pieces", but it was restored by the tramclub to its original lustre as well as possible and presented here to the public at the 100 year jubileum party of the BEB line. 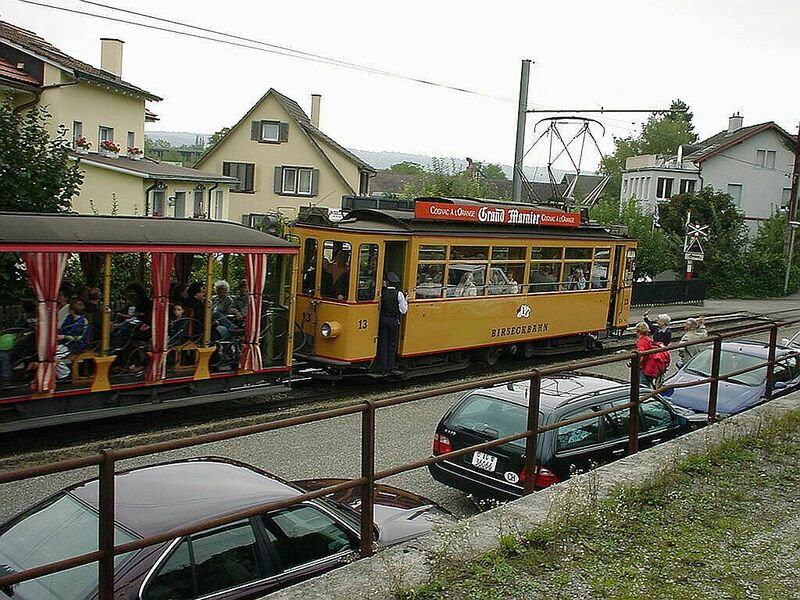 Another view of the old BEB no.4 at Dornach station on 21.9.2002, when tens of enthusiasts were trying to queue and push to get in the old tram and its trailer no. 27 for a free nostalgic ride to Basel. The BEB trailer coach no. 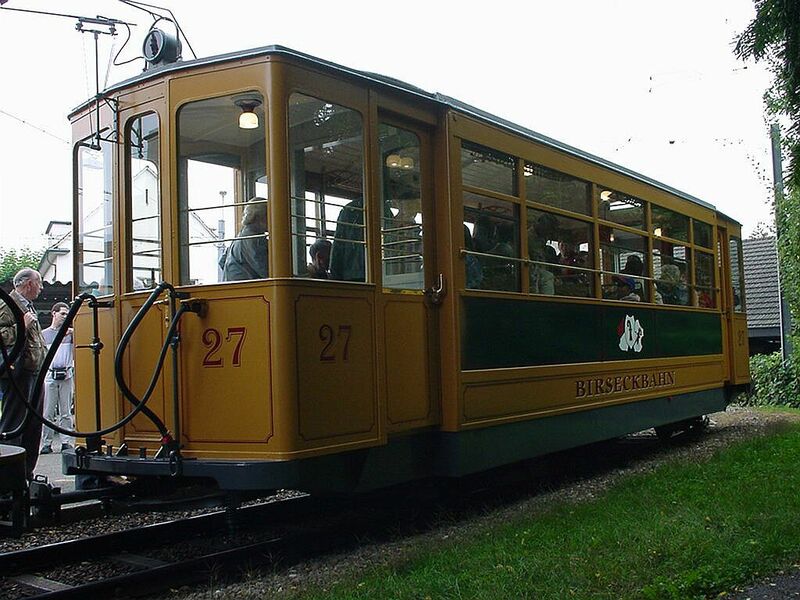 27 is one of the used wagons which BEB got from Germany in 1921, during the years when Germany paid its war debts of WW I. BEB got three trams and four trailer coaches representing the so-called Minden-Merseburger-Potsdamer style and looking particularly German. They soon got the not so polite nickname "Valuta-Wagons". The three motor wagons suffered from a restless, jumpy rolling pace and were therefore not very comfortable until they were rebuilt to 3 axle wagons in 1934. For more than 50 years long these were then the last new pieces of rolling material which the financially ailing company managed to get. They were in hard day to day use until 1971-72. Ready to go, better than new. 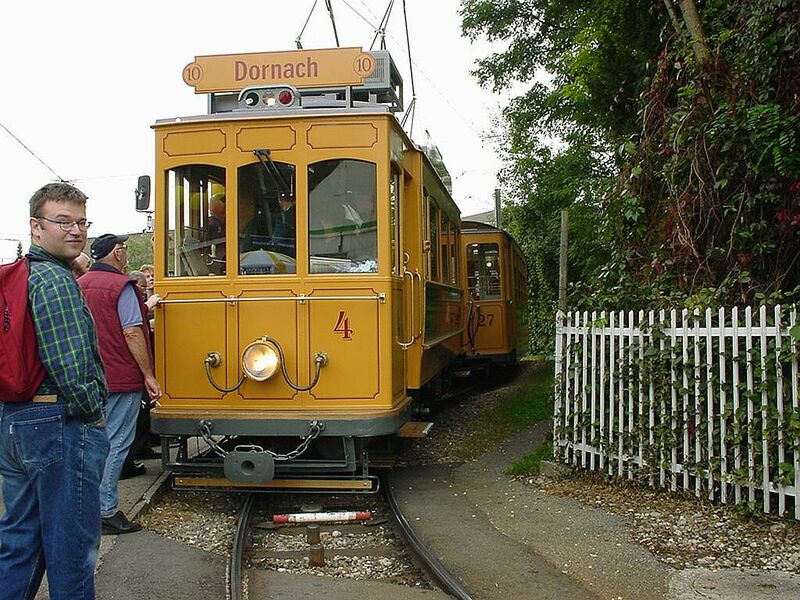 The BEB no.4 leaving Dornach station during its first day of new operations after having been in the rubbish dump for tens of long years and then having been meticulously repaired. There it goes, the combination of Ce 2/2 (Ce 2/3) no.4 and trailer 27. The picture shows particularly well the very German style of the trailer coach. 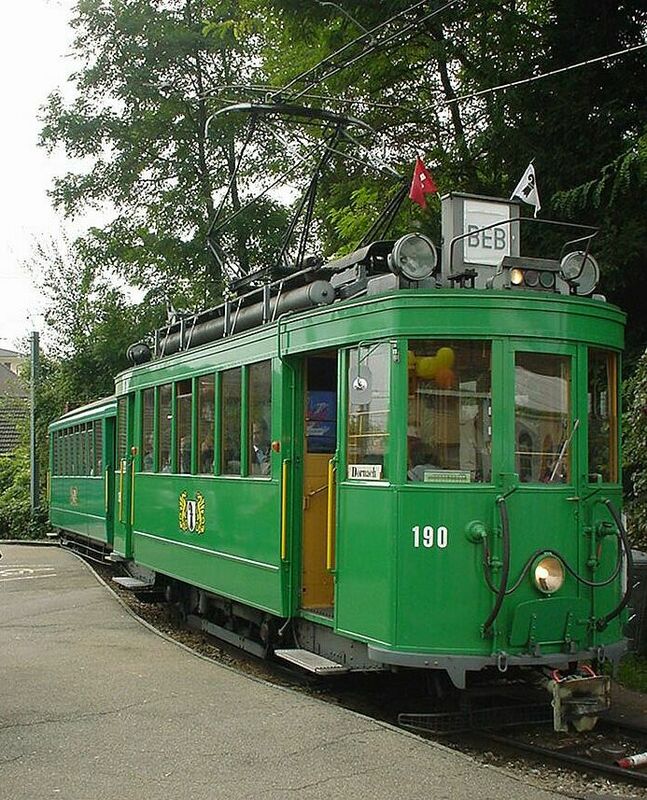 Between 1902 and 1921 BEB got only twice new trams. 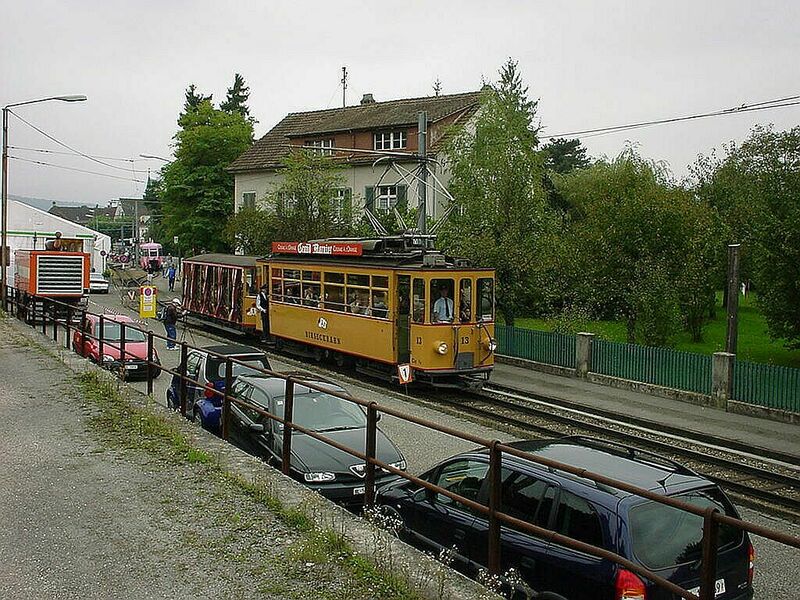 These four axle trams BEB bought when it took over itself the operation of its Dornach-Basel line from B.St.B. in 1916. There were four of these wagons, numbered 12-14 and better known as "Maximum Wagen" due to their then remarkable length. 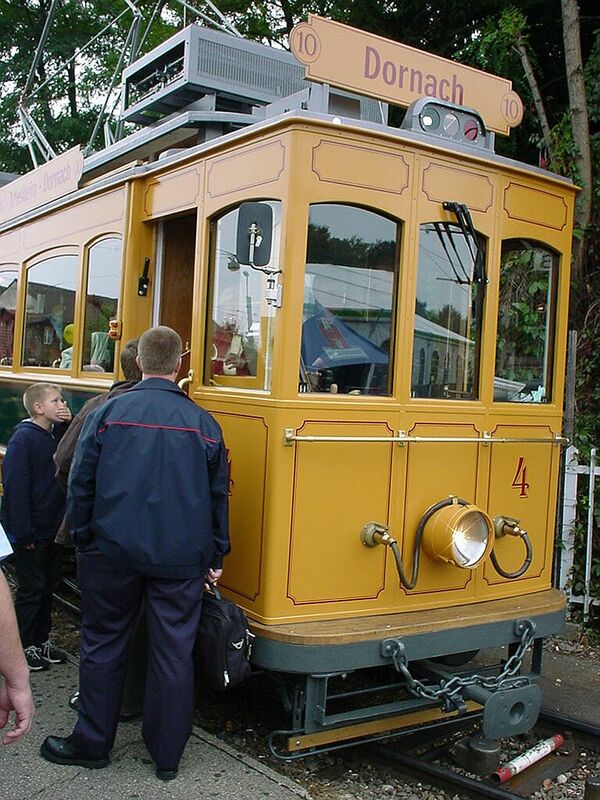 Note how modern the style is for a 1916 tram ! The motor wagons were built by SWS and BBC. They are 11,97 metres long, weigh 18,7 tons and have a maximum speed of 30 km/h. They have two electric motors, each generating a modest 66 kW. Most of the construction is metal, which was very modern and expensive those days. These wagons were used for over 55 years in daily traffic. Another view of the Ce 2/4 no. 13 with its summer trailer coach. Out of the four original "Maximum-Wagen" trams of 1916, two (nos. 12 and 13) have remained until the present day. These originally four axle trams got an additional fifth axle in the 1930s, at the same time as their smaller counterparts did. The original reason for these added axles was to make the roll of the smaller wagons a bit more comfortable and less jumpy.